Luiz Inacio Lula da Silva, affectionately known as Lula, was perhaps one of the most popular presidents in Brazilian history, serving the country from January 1, 2003 until December 31, 2010. His popularity and stature on the world stage is undeniable, but that seems as if that is all the film has going for it, and indeed its only real reason for being. 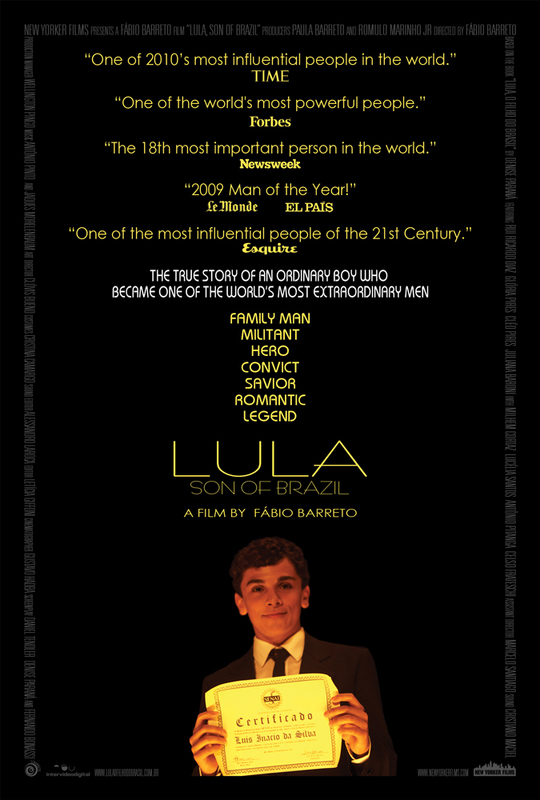 The advertisements for Fábio Barreto's Lula, Son of Brazil boast no blurbs from critics, instead touting quotes from sources like Time, Forbes, and Newsweek praising Lula the man, rather than Lula the film. Which is telling, I think, not only about the way the film is being sold, but about the filmmaker's intentions as well, because ultimately Lula is little more than an advertisement for what a great man Lula is. I'll admit to knowing very little about Brazilian politics, so I have no way of knowing whether Lula was a great president or not. But with such overwhelmingly positive press the man must have been doing something right all those years. If the film is to be believed, while he was busy doing something right, he was also busy doing nothing wrong. He was even saintly as a child, as he stands between his mother and his abusive father exclaiming "men don't hit women!" The film follows him from life event from life event, from a life of poverty with a single mother, to his first job, to graduating from college, to the loss of his first wife and child, and eventually joining the steel workers union at a time when unions were very much distrusted by the government. Lula was constantly surrounded by radicals of all kinds, but always seemed to keep his head above the fray as he quickly rose through the ranks to lead the union into a new period of popularity as government attitudes began to shift. 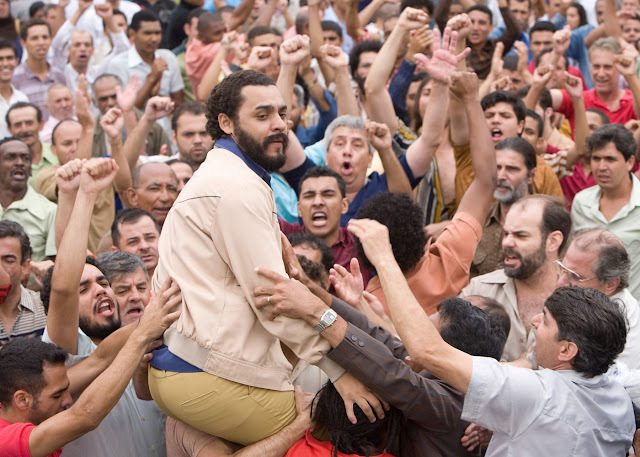 The problem with the film isn't that it portrays Lula in a positive light, it's that it plays out like a campaign trail video of highlights from his life. There is little context, little depth, little subtlety, it's a glorified greatest hits reel. By the time the film is over, we know no more about who Lula is than when we started. It's almost as if the film was directed by his adoring mother, who played such an integral part in his life before her death. "He's such a good boy" is a mother's prerogative, but as a filmmaking philosophy it's remarkably flat. Even if Lula is the saint that the film portrays him to be, where's the drama? Where's the conflict? It's so dramatically inert that it neither gives anything worth rooting for or caring about. It's about a man who rose from poverty to become president, but otherwise the story isn't really all that interesting, tantamount to sitting around and watching the man's home movies. Nothing about it seems to cry out to be made into a movie. It's a loving tribute on behalf of an adoring nation, and while I hesitate to call it propaganda, it's clearly a work meant to do little else than to glorify a political leader, deserved or not. It would have been different if it had something new or unique to say, but it doesn't, which is what separates it from a film like The Iron Lady, whose structure and shunning of political pigeonholing lead to a fascinating look at the life of Margaret Thatcher through her own eyes. Lula's story isn't quite as dynamic as Phyllida Lloyd's vision of Thatcher's (and it doesn't have Meryl Streep), and by the time we reach the end, when audio of the real Lula plays over images of his inauguration in front of a teeming throng, it becomes almost impossible to take seriously. It's a clip reel, not a film. For a film that clearly loves its subject so much, it's lack of fire is both curious and unfortunate. It's a passionate film with no passion, a tribute with no power; a dry, mostly tedious, overly reverential worship of a man who probably deserves something better than shameless fawning, offering little real insight into how the man became who he is today. LULA, SON OF BRAZIL | Directed by Fábio Barreto | Stars Rui Ricardo Diaz, Glória Pires, Juliana Baroni, Cléo Pires, Lucélia Santos, Marcos Cesana, Milhem Cortaz, Antonio Saboia | Not rated | In Portuguese w/English subtitles | Opens Friday, January 13, in NYC.